Ever wondered about what is clean eating? After all, clean eating has become a new buzzword today. Well, clean eating, in its true sense is just a way of eating fresh and healthy foods that’ll help you remain fit and healthy. And needless to say, practicing healthy eating habits is seriously important for all of us. So if you have been wondering about clean eating and want to know about the benefits of clean eating, then here’s the post you must check. In this detailed post, I am going to talk about everything worth knowing about clean eating including its benefits, best practices and some of the cons of clean eating habits. So if you are excited to learn about this new trend of eating clean, then continue reading this post to get it all. Eating healthy for sure is a great way to stay fit and strong for long. After all, when you eat healthy and avoid unhealthy foods, your body will get all essential nutrients, and will be able to fight diseases or disorder much efficiently. This is why when you consult a dietician or nutritionist; they create a proper diet chart according to the need of your body. And when you follow that diet chart, you remain fit, healthy and happy. Clean eating is said to be a very effective and simple method to stay in shape and in good health by industry experts and researchers. But then, there are opposing views as well and many consider clean eating to be too restrictive and sometimes damaging, when it’s taken too seriously. So, other than taking things at face value and jumping to baseless conclusions, let’s check the pros and cons of clean eating and then judge what’s right for us on our own. Clean eating is basically an eating strategy to eat healthy and nutritious foods. But when you dive deeper into it, it is actually more than just a diet. Clean eating is considered to be more of a lifestyle or a way of living than just eating habits. It is a way of approach on how you eat and what you eat. 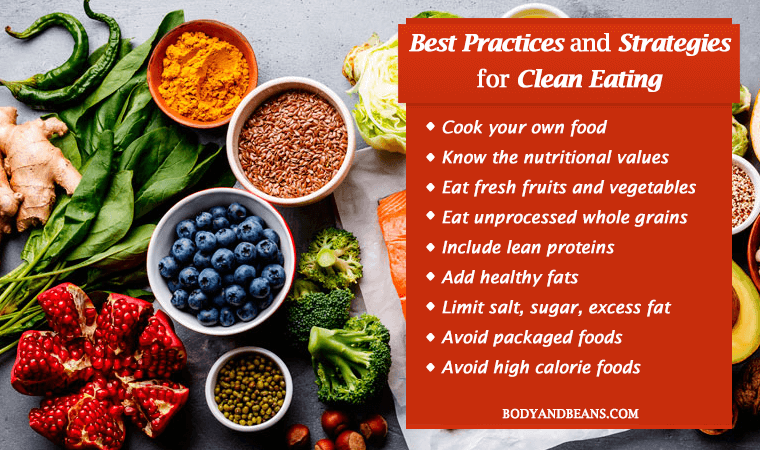 The clean eating strategy involves choosing only the healthy and the nutritious foods such as whole foods and avoiding all of the unhealthy foods like deep fried food or junk foods. The foods you consume mostly will be in their natural state loaded with healthy nutrients and devoid of any unhealthy ingredients or harmful chemicals. Eating clean can help you keep your system clean which in turns help you stay fit and healthy for long. Clean eating is also believed to have a positive impact on both our body and mind and hence it needs your attention. It’s obvious that by practicing clean eating habits, you can remain fit, strong and healthy for long. Practicing clean eating habits can definitely be good as far as your physical and mental health is concerned. So here are a few of the major health benefits of clean eating that’s worth knowing. Most of us have the tension that we might be eating more number of calories than required by our system. But, if you follow a total clean eating routine, there will be an end to frantically counting calories. If you suffering from obesity or you’re overweight, then you may follow clean eating routine to stay fit. This is because it helps a lot in shedding those extra kilos and will definitely help you get back in right shape. Clean eating is believed to be very useful in strengthening your overall immunity. After all, if your body gets the healthy and nutritious foods, it is bound to be strong and will be able to fight diseases much efficiently. Clean eating can also be very beneficial in improving the functioning of your gut. It also helps you to avoid the problem of constipation. This is because clean eating includes a lot of dietary fiber rich foods that helps in proper bowel movements and smooth elimination of the excreta. Clean eating is very healthy for your skin, hair and nails. Clean eating is believed to improve your sleep and energy levels. You stay more active all through the day and get to enjoy a sound sleep at the end of the day. Clean eating is good for both your physical and mental health. It helps in keeping you calm and can easily increase your productivity. Now, that you have known about the possible benefits of clean eating, it is time to know about the clean eating strategies in order to gain the maximum benefits. Although clean eating has created a lot of buzz among individuals, many people are still very unsure about what to do in order to enjoy the benefits of clean eating. So, if you are a beginner and want to try clean eating to remain fit and healthy, then here’re the best guidelines and strategies you should consider adopting. Ever wondered why the restaurant foods taste so tasty all the time? Well, that is because they add a whole lot of oil, butter, ghee, sugar, spices etc. in the food to soothe your taste buds. While the foods may taste yummy, they are most of the time unhealthy for your health. You can’t continue to eat outside everyday and remain fit and healthy for long. So, the first principle to practice clean eating is to start cooking your food at home on your own. By cooking at home, you will be will have full control of the quality and quantity of the ingredients in cooking your food. Eating out occasionally is not a bad thing, but then you have to be very choosy in what you eat, where and how frequently. For me, nothing is tastier than the home cooked food. If you are a beginner, you need to keep yourself updated with nutrition facts and reading nutrition labels will surely give you an idea regarding what foods are good to be eaten. Look for food labels that contain relatively less ingredients. Whole wheat, whole grains, less saturated fat, less sugar, less sodium are some of the things that you need to check out in the labels while choosing your foods. On the other hand, avoid the intake of foods that include the words “modified” or “hydrolyzed” as these types of foods may contain unhealthy ingredients like added sugar or has undergone extreme processing. Eating fruits and vegetables have already been proven to be very healthy for our body. So you should add fresh fruits and vegetables to your daily diet. If you want to practice clean eating, then you better start your journey by eating a couple of servings of fruits and few servings of assorted veggies every day. And when we are talking about fruits and vegetables, I would like to add that eating local seasonal fruits can be very healthy and beneficial for you. Whole grains are nothing but the intact, cracked, ground or flacked fruit of the grains whose main components germ, starchy endosperm, bran are present in same proportions similar to how they exist in the intact grain. During the refining the whole grains into white flour, the germ and bran are removed while the endosperm gets processed into flour. Therefore, as compared to the refined grains, the whole grains are richer as far as dietary fiber is concerned. It is proven that consuming unprocessed whole grains helps to prevent diabetes, cancer, obesity, heart diseases etc. Consuming whole grains definitely forms a part of the clean eating practices and it is highly recommended that you eat about 3 servings of whole grains per day. This includes oats, barley, wheat, brown rice, corn etc. Including lean proteins in your diet can be the easiest and best strategies for beginners who want to adopt green eating. Foods like wild caught fish, lentils, nuts, beans, and meats are considered to be great source of lean protein. Amino acids are the building blocks for proteins that are instrumental for enzyme activity that leads to reactions in the system. And so it is better that you eat some lean protein rich foods with every meal throughout the day. Healthy fats are mostly the unsaturated fats that are helpful in reducing any kind of inflammation in the system. This promotes the health of your heart and lowers the levels of bad cholesterol in your body. If you are adopting green eating, then just make sure that your diet contains healthy fats such as avocado, nuts, salmon, and seeds. It’s also better to use extra virgin olive oil or rice bran oil for cooking your foods as these oils are considered to be better and healthy. Clean eating has the intention of eating foods in its most natural form or state so, it is best to avoid foods that contain unnecessary additives like fat, sugar, salt etc. Avoid white salt sprinkle as much as you can, similarly, you should limit the consumption of sugar in your coffee and avoid sugary beverages like cold drinks etc. Processed and packaged foods may be easy to eat but they may not be very healthy like fresh ingredients. They do contain all of those added conservatives and so, it is recommended that you avoid them as much as possible. Moreover, most of them are lower in vitamins and minerals and contain unwanted ingredients and so, they are not that useful for your system. So while practicing green eating, you have to be mindful of not eating processed and packaged foods. While concentrating on what you are eating every day, you need to be mindful of what you are drinking because. Well, water is the safest drink to keep your body hydrated and clean, so make sure you are drinking enough water throughout the day. However, in the name of keeping your body hydrated, please avoid beverages that are rich in calories like carbonated drinks. Similarly, sodas are not a wise choice because they contain high fructose corn syrup or other refined sugar that are not very healthy for your body. Also, fruit juices have added flavor and hence you should be mindful of drinking such juices. While packaged fruits juice may contain more amounts of nutrients than soda, they do contain more calories and sugar, so you must be careful. It is recommended in clean eating that you eat a piece of raw fruit rather than drinking fruit juices. But if you like to have juice, then you should have freshly made juice, because that is much better than the packaged juices. In order to follow clean eating, you need to reduce the carbon print by avoiding processed foods, limiting the intake of meat and concentrating more on plant-based foods. If you are going for foods without the use of pesticides, herbicides, or hormones, then that will reduce air, water and soil pollution to a great extent. So, this should be in your plan. I hope you have noted down the clean eating guidelines properly. But, one thing you must not forget is although clean eating looks quite promising, many experts believe that it is a bit too restrictive and may lead to eating disorders. Come, let’s check the cons of green eating and then take a call. As per “British Medical Journal”, many of the claims by the clean eating are nothing but a “loose interpretation of facts”. They believe that while practicing clean eating can help in staying in shape and physically better, there are other less- restrictive dietary approaches as well that give you the same benefits. In short, clean eating is a good way but it is definitely not the only way to remain healthy. 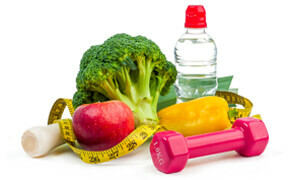 You may actually opt for less strict diet routines to stay fit. Clean eating is definitely healthy for human healthy but many individuals go to such an extent that it becomes an obsession for them and that is when the problem starts. They become so obsessed in finding the cleanest foods that they often become too depressed or even physically punish themselves if they believe that they have eaten something that is not clean. Experts actually call this fixation orthorexia, meaning the fixation of righteous eating. And, as per the journal “Social Science and Medicine”, many clean eating diets actually fall under the banner of orthorexia. Due to the thinking that foods that contain any kind of additives are dirty or are not in the purest natural state, many miss out on the beneficial food additives. Like for example, Vitamin D may actually be added to milk in order to make bones strong or iron may be added to an orange juice. While these foods may not be considered pure but many a times, they actually help in achieving daily nutritional needs. Sadly, a person obsessed with clean eating will never understand this. So, we got no such proof that it is 100% perfect for our health. Moreover, the concept of clean eating should be eating healthy foods in general but instead they put emphasis more on avoiding dirty foods or eating only pure foods. Clean eating many a times can also make someone actually weak. This is because clean eating involves cutting out certain foods which often makes it hard to get enough food overall. Your body needs energy to say fit and if it is not getting enough of it, then you may actually fall ill in the long term. Clean eating most of the time focuses on eating veggies but that is not enough for supplying your body with the calories that it requires all the time. Following such a clean eating may also lead to nutritional deficiencies. After all, you can stay fit when you get all of the nutrients in balanced amounts. Like for example, eliminating dairy is harmful as it affects your Vitamin D or calcium intake. If you are following a clean eating diet and fail to replace the diary with something else, then you will definitely suffer from deficiencies. Over to you: Do you practice clean eating? There has been a lot of debate on clean eating and its diet concepts. While some believe it to be very perfect for a healthy living, there are others who refute such claims. Well, if you take my personal opinion, then I am for it, but not to the extent where it become an obsession. In short, clean eating is a great diet concept but it does have its negative side effects on some of the individuals who take it too seriously. There’ll always be debate and there may be both positive and negative side to the green eating concept. So, what we can do is to somehow take the middle path because that will help us gain the benefits as well as not get too restrictive as far as our diet is concerned. Whatever you eat is definitely a deciding factor of how healthy and happy you become. So you must definitely eat healthy and definitely include foods that are healthy, fresh and natural. But at the same time you must also opt for other healthy options which clean eating may not certify to be clean. Firstly, try to treat clean eating as healthy eating habits and try to include all food groups in your diet because when you do that, you are going to get balanced nutrition. Stop being too obsessed with eating only the organic, dairy free, gluten free or raw foods. If you are tolerant of gluten, go and have your slice of bread. Trust me, if you treat food as your energy, it will actually become worst. Eat everything that your body permits to but in balanced amounts. Do not make clean eating your obsession and get anxious or depressed if by chance you cannot stick to it. Well, you do need to be disciplined with what you are eating but, it is sometimes OKAY to break the rules of dieting to make yourself feel good as far as good food is concerned. So, that is all I had to tell you all about clean eating and its possible pros and cons. Do share me your feedbacks and views on it. I will be happy to know what you feel about this post. I am open to suggestions as well, so you may share that with me if in case you have any. Also, if you did like my post on clean eating and found it valuable, please do like, comments and share it with others and help me reach to a greater number of people. You all have supported us so far and I seriously hope to get your support in future as well. Until then, eat clean and stay healthy.